We are in the middle of updating our master bathroom when we find some extra time. 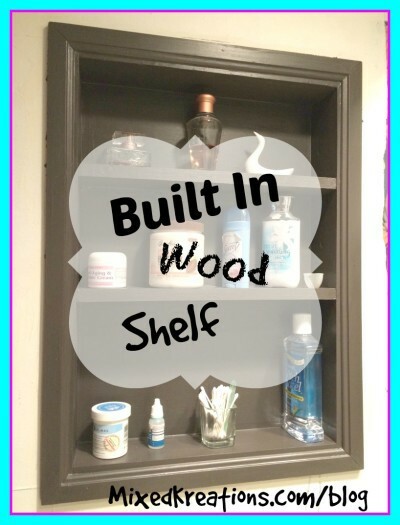 One thing I was wanting was a built in shelf. 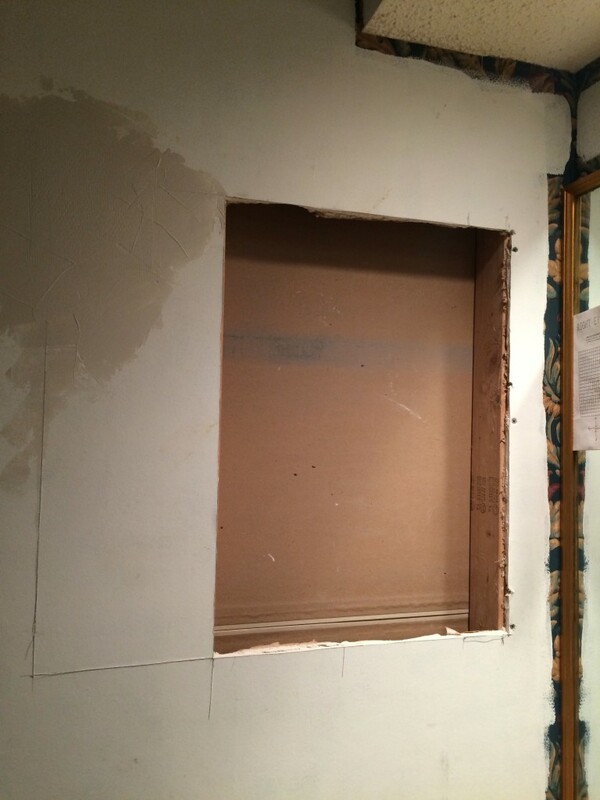 So the hubby cut a hole in the sheetrock for me. 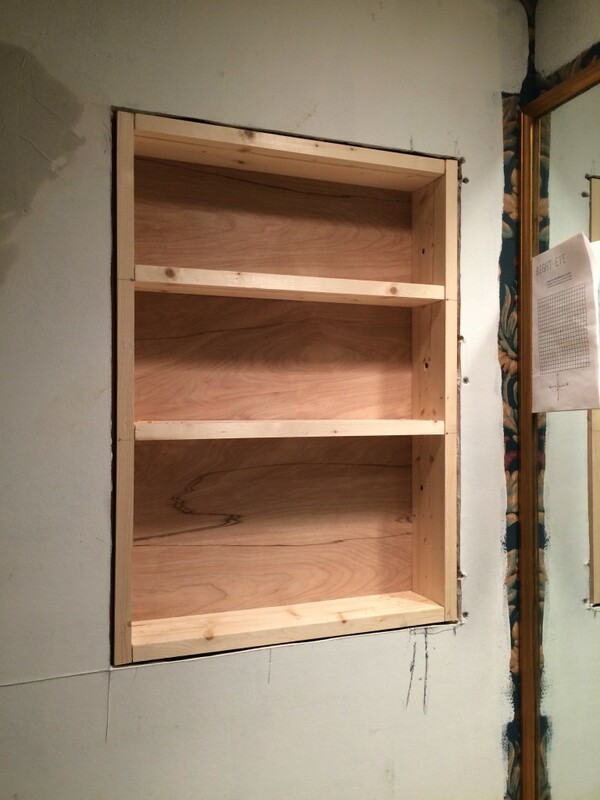 While I built a shelf out of pine the size of the hole in the wall the hubby added some extra two by fours in the wall for support. The hubby helped me connect it to the two by fours in the wall. 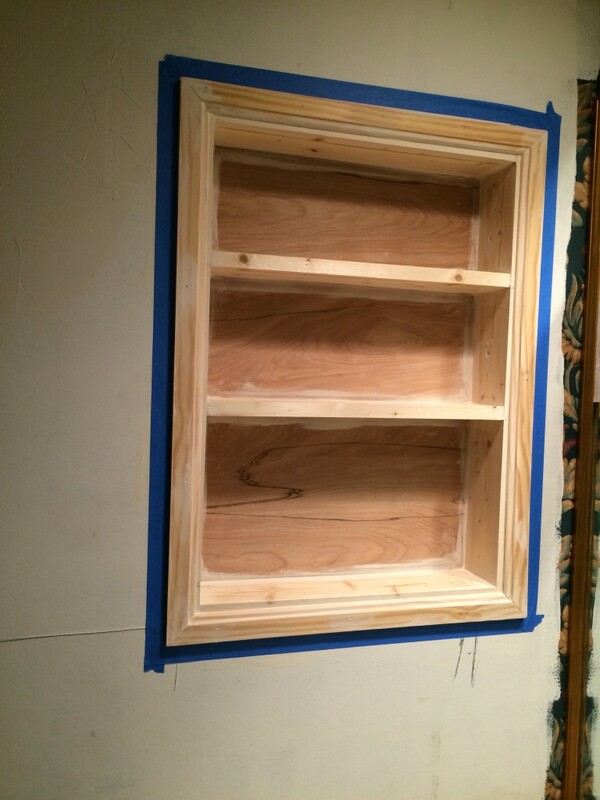 I then added some trim around my new built in shelf. I taped around my new shelf before I started painting. 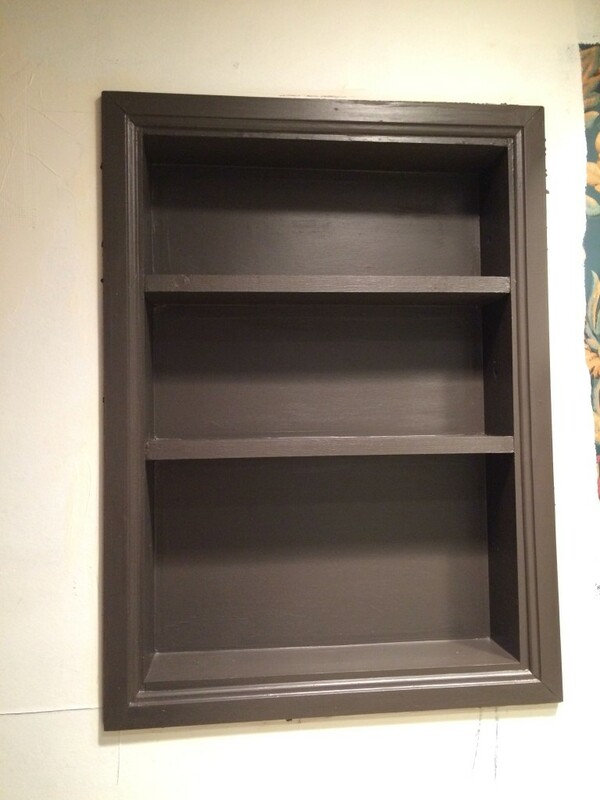 I picked a dark mocha paint because our granite counter tops have just a tiny bit of that color in it, and I am going to paint the cabinets in the bathroom this same color. 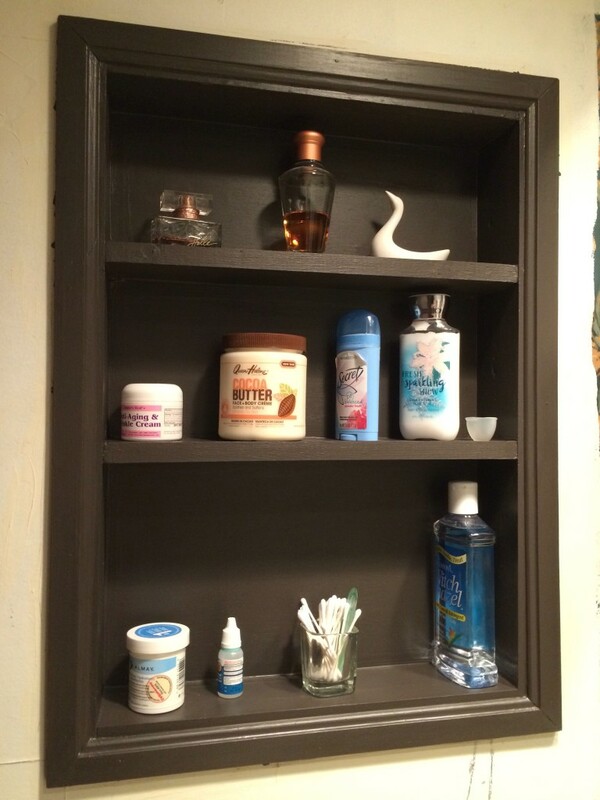 Now I have a place to put my things without having them spread all over the counter. 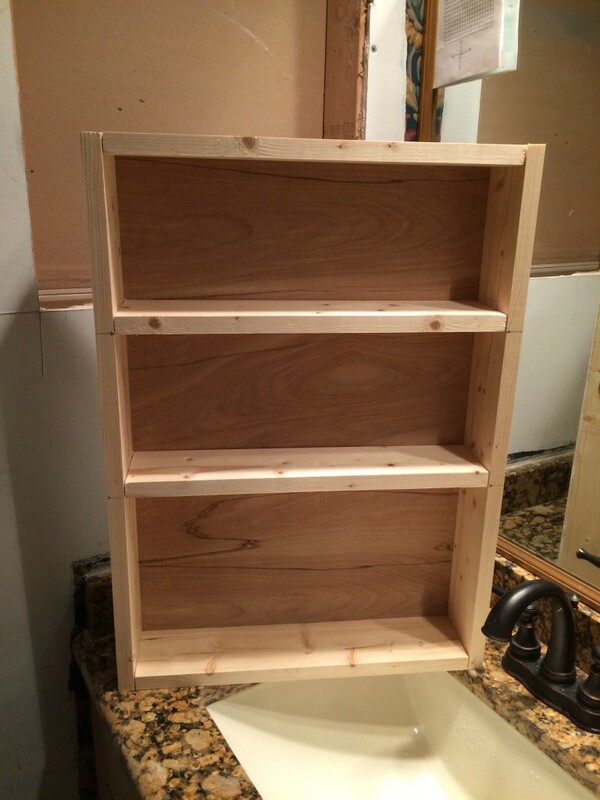 How do you like my new built in wood shelf? I love it!!! We are starting a Master Bath remodel next month. I love how you have a place for your stuff. My area around the sink is small & my junk is everywhere! Thanks Cathy! That’s exactly how my counter top was. That’s why I wanted the shelf. This is so clever and cute! 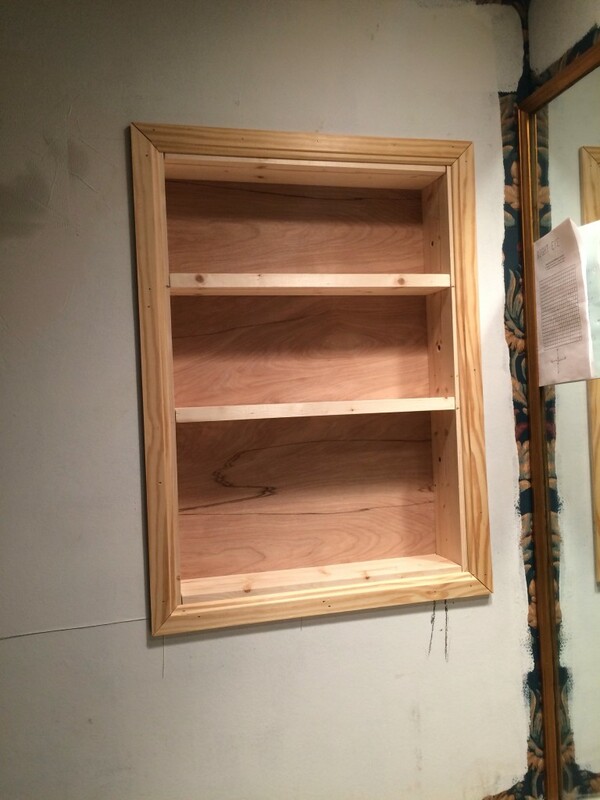 It also looks very practical for convenient storage. Thank you! Thank you Jennifer! That’s exactly what I need, something convenient. How beautiful, and I am sure the extra space really comes in handy! Thank you Carlee, it does come in handy. Now I don’t have everything all over the counter. What a great idea Linda. It makes quite a statement in that deep chocolate color. And it is practical too, so you can use it for storage or display. Thanks Mary! I thought that color would look good with our countertops as well, I was thinking about distressing it some but just haven’t tried that yet. What do you think? What a great job! Can’t wait to see what the rest of the bathroom looks like. Thanks Karen! It will be a while before we get it all finished, working on it a little at a time after work. But will post when we are finished. Thanks Winnie! It was really easy to make. Thanks for stopping by!